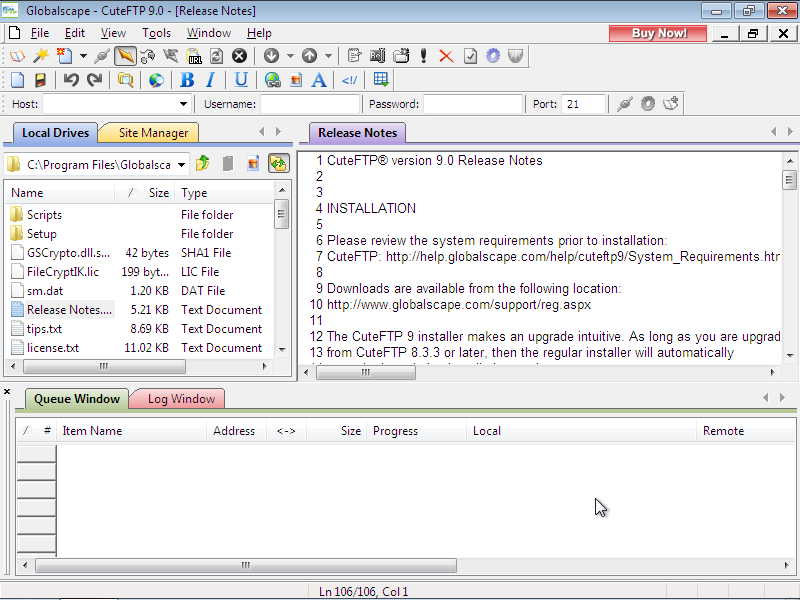 CuteFTP Free Download latest version 9.0.5 for Windows 32/64 bit. Get CuteFTP offline setup, standalone installer. CuteFTP 9 is the best premium ftp client in the market. Previous to this version, used to be 3 editions: Lite, Home and Pro. Now everything is put just in one package. You can use this ftp client at office or at home. Uploading files and downloading never been easier. The user interface is split in four panlels: Remote panel, Local panel, Session Logs and at the bottow of the interface you will find two additional windows, one for Logs and another one for file transffer Queue. The Remote panel shows information about files located on the remote connected computer which are available to download. In the Local panel you will find two tabs which show information about your files and folders that are available for upload and a list of your ftp connection details. The Session Logs tab store information that is gathered over time about all sort of events (downloading, uploading). Your activity during a connected session is displayed on the Queue window at the bottom of the interface. Here you will see the status of the uploads and downloads. You can also pause, stop or delete any activity. The interface also has plenty of text editing tools and configurations for the applcation. You can View, Open, Rename, Edit remote or local files. The information needed for establishing a connection is stored in the Site Manager for later use. Here you can define each connection as you want. If you want a fully free ftp client download WinSCP for our website. This version of CuteFTP offers support for multiple connections at the same time. Create macros and scripts to improve productivity. Multiple secure connections to remote computers at the same time. High Security: multiple encryption options at your choice. Unicode support for file names. Site manager: set custom setting for each one of your saved connection details. Folder Synchronization: mirror the data stored on your local drive to the data stored on a remote machine with ease. OS: Windows XP SP3, Vista, 7, 8, 8.1, 10 and Windows Server 2003 and 2008 R2. Click the link below to start the CuteFTP Free Download Latest Version 9.0.5. If you have any problems while downloading please leave a comment below. After the page opens remember to choose the “Download through your browser” option to start downloading CuteFTP Offline Installer, Standalone Setup.